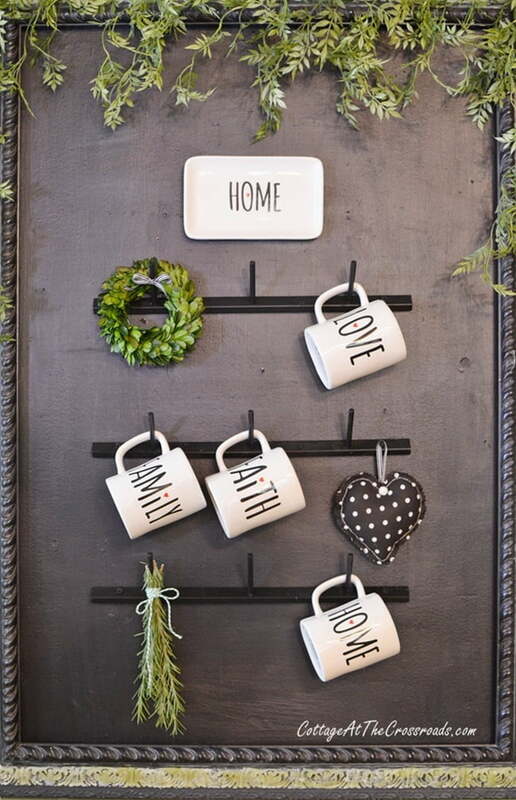 I’ve been yearning to have my own farmhouse style mug rack for quite some time now. 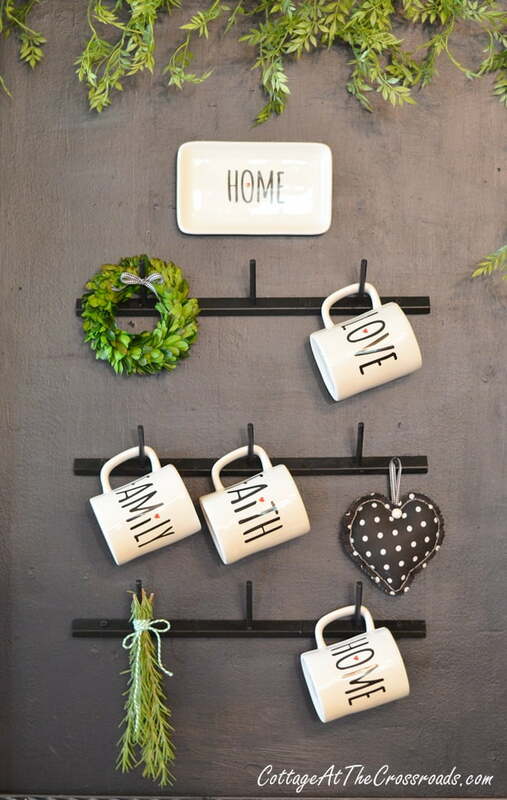 Every time I’ve seen one of those metal coffee mug/glass drying racks, I’ve thought about how I’d like to have one hanging on the chalkboard in our kitchen. But, alas, most of the ones that mount on the wall are too big for that space. But I’m here to tell you how you can get a similar farmhouse style look for a whole lot less money! You are not going to believe what we used to make this! You may even have one of these around your house. If not, grab one whenever you see one at a thrift store or garage sale. I nearly pulled the trigger on ordering several of those (Amazon aff. link) Rae Dunn mugs and one of those (Amazon aff. link) metal glass drying racks but then said, “WHOA!” So out of the storage building came the thread rack! 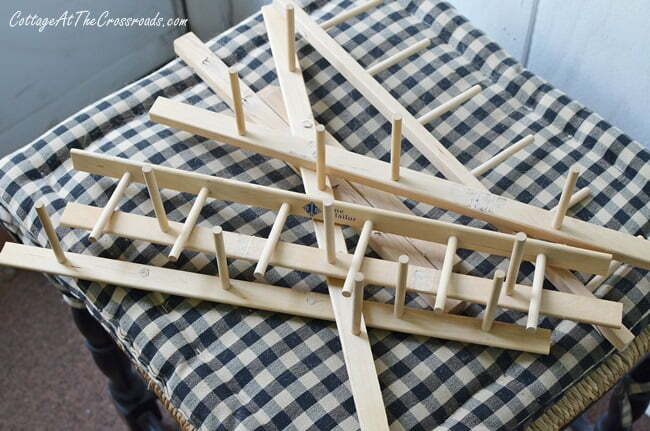 Then I took the rack apart and asked Leo if he would cut off some of the pegs with his jigsaw. 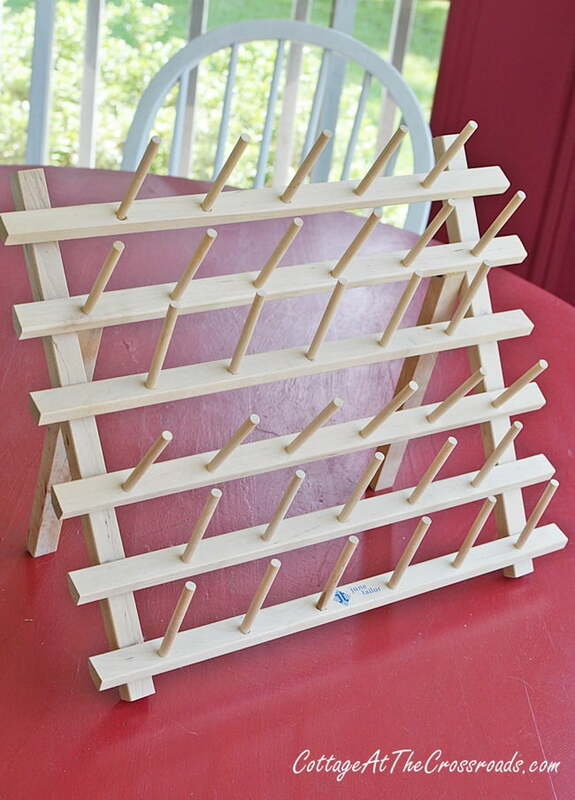 I decided that I only needed to use 3 strips of pegs on the chalkboard so I have some left over. 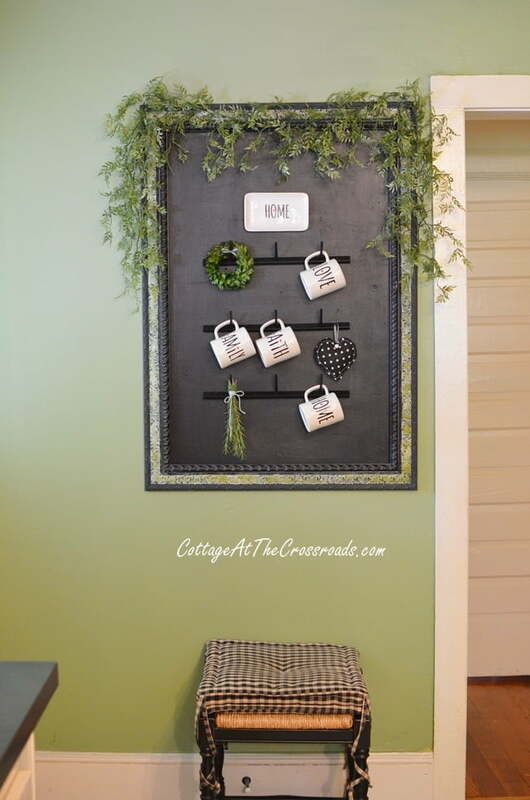 I painted the ones that I was using for my farmhouse style mug rack with black chalkboard paint. Leo screwed the strips into the wall for me. 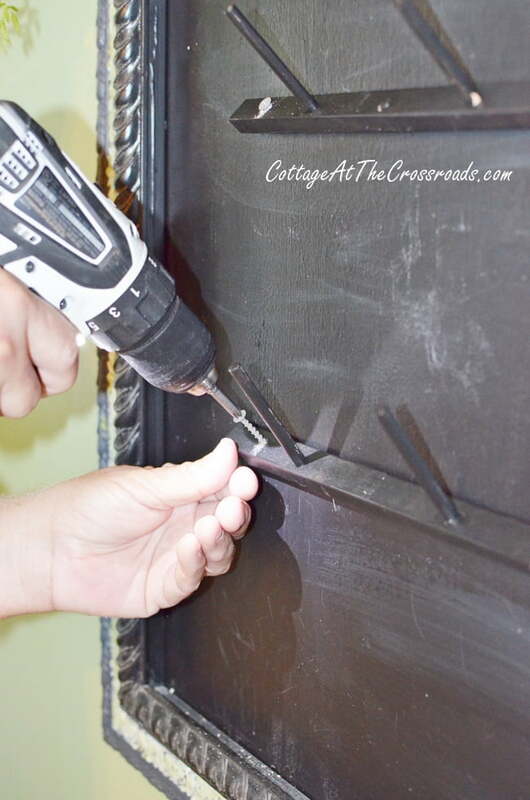 Did I ever tell you that the chalkboard is really just a section of the kitchen wall that I painted with chalkboard paint way before we ever started blogging? After we got the mug rack attached to the chalkboard, I kept going to Amazon and looking at those Rae Dun coffee mugs. I think they are so darn cute with the large words printed on them, but I just couldn’t bring myself to pay that much for them. We just happened to be in Cracker Barrel (where we meet to pick up the grandgirls sometimes) and I spotted this mug set reduced to half price. It came home with me, of course! The mugs (and the little appetizer plates that came with the set) have all the words that are important to me: HOME, LOVE, FAMILY, and FAITH. I couldn’t get home fast enough to hang them on our DIY Farmhouse Style Mug Rack that we had just recently created. 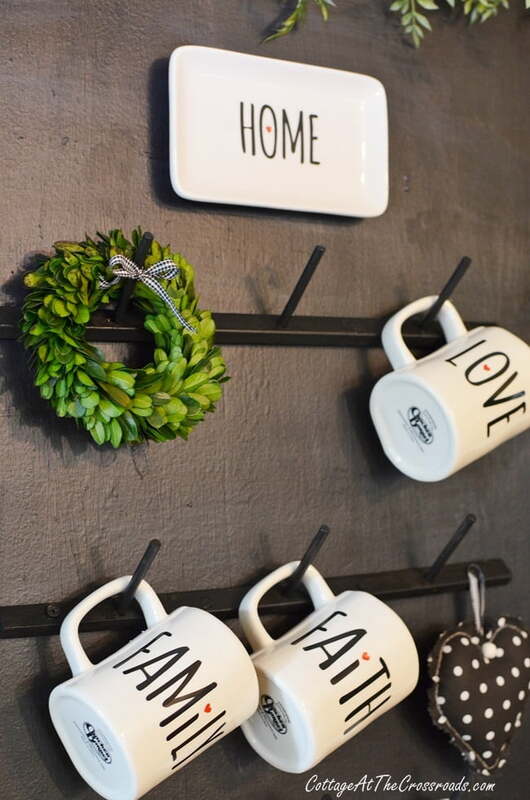 To style the Farmhouse Style Mug Rack, I hung a little preserved boxwood wreath and the black and white heart that I already had. To add a little more green, I went out into the garden and cut a few pieces of rosemary to hang on it. It adds a wonderful aroma in the kitchen. 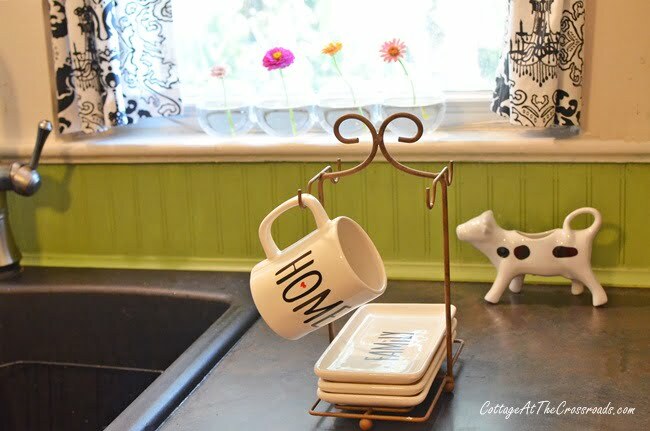 If you want to add a little farmhouse vibe to your kitchen, just be on the lookout for one of those wooden thread racks so you can make your own Farmhouse Style Mug Rack! 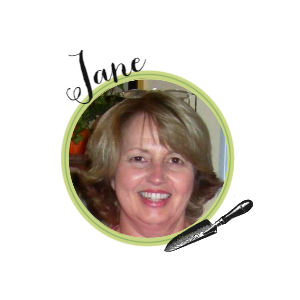 P. S. Thanks for all your thoughts and prayers for my mom. She is doing much better now and I’m back to blogging! 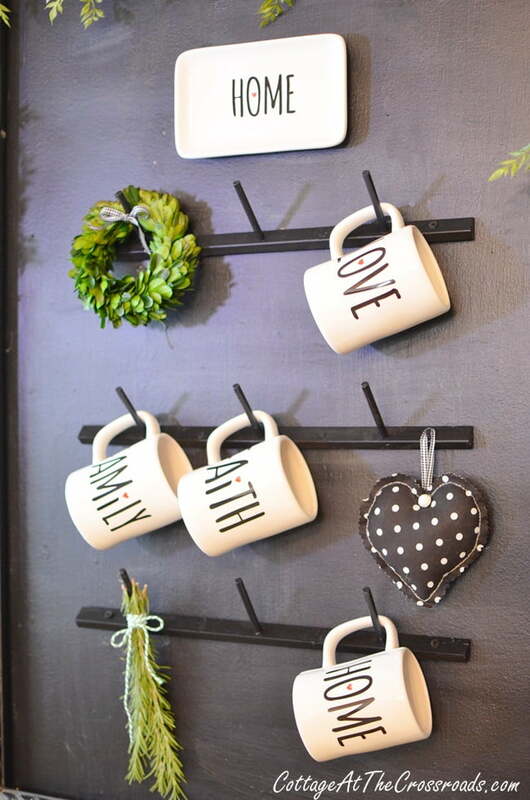 The mug rack is really fabulous. I love this rack. I really appreciate to doing this.Just wanna say thank you for the information you have shared. Just continue writing this kind of post. I will be your loyal reader. Adorable. What a great idea. I think the mugs are cute too but I can’t see paying that much for them. This is too darn cute!…and what a fantastic and creative idea! You hit it out of the park on this project…as you always do! Great find at the C.B. I can just imagine you rushing home and being so anxious to display your great find and bargain. Jane, this is such a great idea! I love how it looks in your home, beautiful. Very clever, handy and lovley to look at all at once. 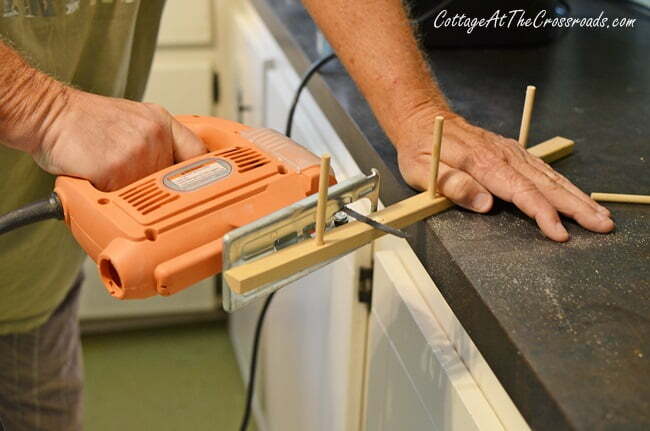 I just love this DIY!! What a smart idea to make this out of the thread rack. I love the whole vignette on the wall. Those Rae Dunn mugs are cute but when I’ve seen them I always wonder if people really drink coffee out of them. They aren’t the kind we really like. Love it!! I have the same problem with limited wall space in my kitchen, too. It’s funny though how eventually things work out. So glad to hear of your mother’s recovery. Keep those ideas coming to us, Jane!! ❤️ this. You are beyond talented. Hello to Leo. JANE, JANE, JANE!!! I loved this so much I went to GW and got my gently used thread rack and copied your blog and (“thank you very much”)… its just great! I’m making another one for my sewing room! Love it all! Glad your mom is better. What a great idea!! It looks lovely …you dressed it up so cute… I wondering where u went….I thougbt you were out travelling in your RV..???? Oh. So. Cute! not to mention “thinking outside of the box” creative! What a creative idea! I love the way you styled it and that it is just painted on the wall. Very cute!